Michelin has pledged to find jobs for the remaining 300 workers at its Ballymena plant ahead of the factory’s closure next year. The tyre maker announced the closure of its Raceview Road plant two years ago and the gates will finally close next June. The company is now encouraging businesses across Northern Ireland to tap into the skills of its remaining 300 workers. Since the November 2015 announcement, 260 Ballymena staff have found new jobs, 65 have retired and a further 43 have transferred to other Michelin facilities, including 14 to the company’s Stoke-on-Trent site and 12 to Michelin in Dundee. A further 17 workers have found roles in Michelin’s Canadian, French, German, Spanish and US factories. There are still about 300 skilled employees looking for jobs and, with limited time until the site winds down, Michelin is urging companies to consider their Ballymena colleagues before launching any recruitment drives. John Milsted, factory manager at Michelin Ballymena, said: “Finding jobs for everyone at the plant is our number one priority. “Michelin prides itself on its staff development, and that means our workers have a wealth of transferable skills – they are versatile, they have a strong work ethic and employers in the region could immediately benefit from taking them on. Mr Milsted praised workers for continuing to ensure high levels of safety and production efficiency at the plant. 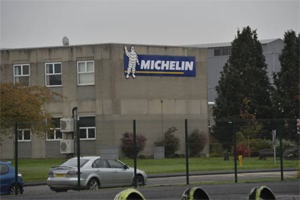 Michelin said it was conscious of the effect the closure would have on the area and gave more than two years’ notice to its original 840 employees. The company said this was to allow time for workers to find new opportunities – and to take advantage of on-site career advice and support delivered in conjunction with Career Decisions Ireland. Meanwhile Michelin Development, Michelin’s small business mentoring and funding operation, encouraged employees to come forward with new business start-up ideas and apply for financial backing. Michelin Development funding and advice to start-ups and small firms has already unlocked the potential for more than 130 new jobs.